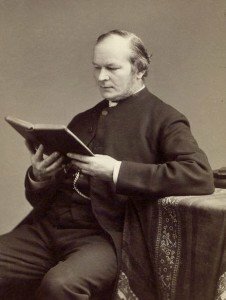 “Whatever is well said is a saying of the Blessed One.” Well, maybe not. From time to time I receive critical messages from people, claiming that the Buddha was too spiritual to bother about things like being misquoted, or having words put in his mouth. How they know this, I don’t know. Perhaps they have some kind of mystical communion with deceased enlightened beings. Not having such powers, I have to read the Buddhist scriptures for clues to his attitude. There I find the Buddha, at times, facing people who say “I heard you said such-and-such,” and when their information is incorrect I see him putting them straight, in no uncertain terms. But there’s also a passage in the Digha Nikaya where the Buddha explicitly talks about being misquoted. (Thanks to Arjuna Ranatunga for reminding me of this sutta). There the Buddha runs through various scenarios where one might hear that the Buddha is reported to have said something or other. What’s our response meant to be? That’s what this blog is about, although generally I try to find where non-Buddhist quotes have originated and, being human, I sometimes fall into scorn. I’m working on it, though. This would seem to suggest that if the Buddha’s quoted as having said something, then as long as the quote is “well-said” we should accept it as his word. This is a rather odd idea, on the face of it. 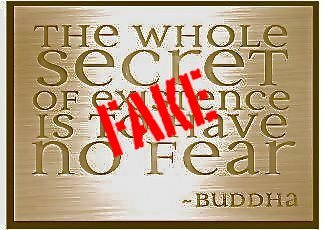 It’s hard to imagine someone as ethical as the Buddha being prepared to take the credit for others’ bons mots. Take a look at the context of the sutta, though. Uttara is in a conversation with Sakka, the king of the devas (or gods). As an aside, what does this mean? I tend to assume that such conversations are the recordings of inner dialog. In this case Uttara would have been musing on the nature of authenticity. He’s just given a teaching, and a note (perhaps of doubt) creeps into his mind: “Whose teaching is this, mine or the Buddha’s?” And an answer comes to him: It’s basically the Buddha’s teaching; I just go to the grain pile and carry away basketfuls of Dhamma as I need them. I’d suggest reading the following passage in that light. Or maybe you believe in gods. 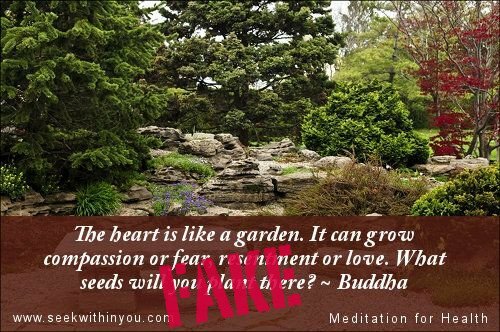 But it’s obvious from the context that what is “well said” refers to that which is taken from the grain pile of the Buddha’s teaching. 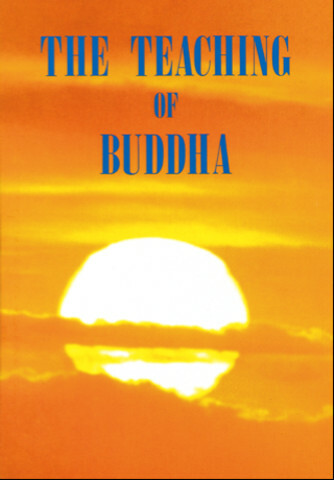 It seems likely that Uttara was actually saying “whatever I have said that is well said is the word of the Buddha.” This is not unlike a common line that is found in book acknowledgements, along the lines, “Whatever is of value here comes from my teachers; the errors are all my own.” Uttara was not saying that if Voltaire or Douglas Adams or Virginia Woolf happens to say something neat it can be co-opted as Buddha-vacana — the utterance of the Buddha. 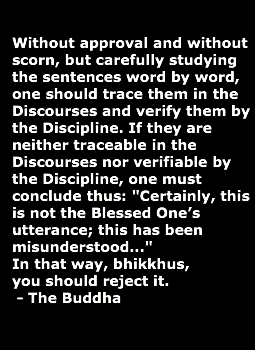 So ultimately Uttara’s utterance doesn’t contradict the Buddha’s teaching that we should scrutinize supposed Buddha quotes and reject those that aren’t genuine.